We can Take Care of Orthodontics for the Entire Family! The word “orthodontics” comes from the Greek for “straight or proper” and “tooth.” That the word has Greek origins is entirely proper considering that somewhere between 400 and 300 B.C., Hippocrates and Aristotle pondered ways to straighten teeth and fix other dental imperfections. Archaeologists have even discovered mummified people with apparent metal bands wrapped around their teeth. French dentist, Pierre Fouchard, is credited with inventing orthodontics in 1728 when he published his book, “The Surgeon Dentist,” on ways to straighten teeth. Delabarre introduced the wire crib in 1819, marking the beginning of modern orthodontics. 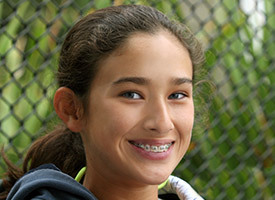 Orthodontics focuses on fixing improper bites that might cause jaw problems or crooked teeth. 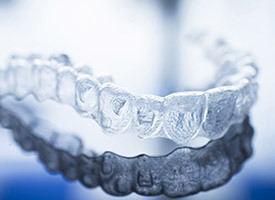 Traditionally, orthodontic treatments involve using a system of brackets and wires to gradually realign teeth and retainers to solidify the results. Today, there are also alternative orthodontic options for adults including Invisalign clear plastic aligners. Why Choose Robison Dental Group for Orthodontics? Metal braces are still the most reliable, durable, and affordable orthodontic solution available today, able to correct simple and complex alignment problems with ease. First, we will assess the level and nature of a patient’s bite problem to determine the best course of treatment. Then, we will place the brackets and wires of dental braces onto the teeth. The wire is held in place against the brackets with elastic bands that come in a rainbow of colors. The bands give children the chance to make wearing braces fun by choosing their favorite color or their school’s colors. Braces patients will need to visit our office regularly to have them adjusted or tightened and the wire exchanged as the teeth move toward their proper positions. We recommend that your child should undergo an orthodontic evaluation around the age of seven. At this point in their development, Dr. Robison will be able to tell if their adult teeth will come in straight or whether they will require orthodontic treatment. To help lessen or prevent any alignment issues, he can use an approach called Phase One Orthodontics, in which your child will wear one or more removable oral appliances that will guide their teeth into the proper positions. Afterward, he’ll reexamine their teeth to see if any further treatment is needed. In many cases, this method can drastically shorten the time a child needs to wear braces or help them avoid them altogether.